Cast: Lawrence Tierney, Edmund Lowe, Ann Jeffreys, Eduardo Ciannelli, Marc Lawrence and Elisha Cook Jr.
During the early 1930s, outlaws rampaged across much of America, seemingly robbing banks and kidnapping at will. Some of the more famous of these outlaws were Baby Face Nelson, Pretty Boy Floyd, Bonnie Parker and Clyde Barrow, and Alvin Karpis and the Barkers, but John Dillinger was undoubtedly the star. The Public Enemies Era lasted from 1933 to 1935, although Karpis, the last holdout, evaded capture until 1936. Tired of living on a farm, Dillinger moves to Indianapolis, Indiana to become a broker. However, he failed, so he holds up a grocer for the money needed to keep up appearances. After bumping into a police officer, he ends up in prison where his cellmate, Specs, is the smartest bank robber in the country. Specs serves as his mentor, and Dillinger plans to help him and his three partners escape if they let him join the gang. 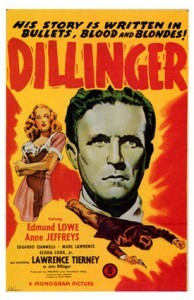 After he is released, Dillinger robs a movie theatre to get the money required to smuggle guns to his friends. The gang breaks out of prison and they start robbing banks but Dillinger soon becomes tired of being the low man on the totem pole, partially because Specs constantly treats him like a child. After another wave of bank robberies, he is caught in Tuscon and sent to jail in Indiana to stand trial for murder but he escapes and rejoins the gang. Following a disastrous robbery, the survivors go to ground at the Bohemian Lodge, which belongs to the adopted family of one of the gang members. When the police learn of that location, Dillinger ends up hiding in a tiny apartment for months as his money gradually runs out. Having gone stir crazy, he finally emerges from his apartment to see Manhattan Melodrama at the Biograph Theater but the police are waiting. Although the story follows the general sequence of events, there are a number of historical errors. The real Dillinger was the son of a well-off grocer, who drifted into petty crime and hanging around pool halls before graduating to robbing a local grocer. Receiving a sentence of seven years, he became friends with experienced bank robbers Harry Pierpoint and Homer Van Meter. The exact means of Dillinger’s escape from prison has been debated by historians but the movie’s version follows the legend closely. While Specs does look at blueprints of the bank when planning a job, the screenplay ignores the meticulous preparation of getaway maps and gas caches or the gangsters’ practice of taking hostages to deter pursuit. At one point, Specs borrows three men from a mobster for a particularly difficult job but the real Syndicate refused to let its men moonlight as bank robbers because they did not want to attract attention. The gang uses complicated schemes to rob banks but the genuine gang simply walked into banks, showed their guns and then walked out with money, often after a gunfight. Also, the gangsters did not rob trains at that time because they were considered too hard. Furthermore, Dillinger never had his own gang. He was part of Harry Pierpoint’s gang until Pierpoint was arrested, and then he joined Baby Face Nelson’s gang. However, none of the actual members of either gang or his girlfriend appear in the movie. The story has been heavily altered, presumably to show that crime does not pay and to make the law enforcement authorities more competent than they actually were. 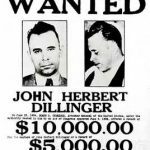 Admittedly, the real Dillinger’s long-term future was grim since most of his partners were dead or in prison, but he had received plastic surgery and was able to go out wherever he wanted. In addition, the real FBI agents were unwilling to take any chances and started shooting as soon they saw him. Strangely enough, the FBI is not mentioned in the film, even though it was responsible for hunting down the Public Enemies. The movie’s Dillinger is much more vicious than the real version, who took pride in his gentleman bandit image and sent money to Pierpoint’s family after he was caught. It has a good cast, moves along nicely and shows dramatic tension well. Tierney is excellent as a tough guy, who is willing to do anything to get ahead. It resembles a film noir more than a straightforward biographical drama, and the movie’s budget was clearly tiny, even for a B movie, since several sets were used more than once. The Production Code stopped the director from showing the violence, so it was left to the viewer’s imagination. Even though all of the deaths are off-camera, it was considered to be extremely violent for its time and was attacked by conservative groups for its sensationalist approach.